Well I made it! 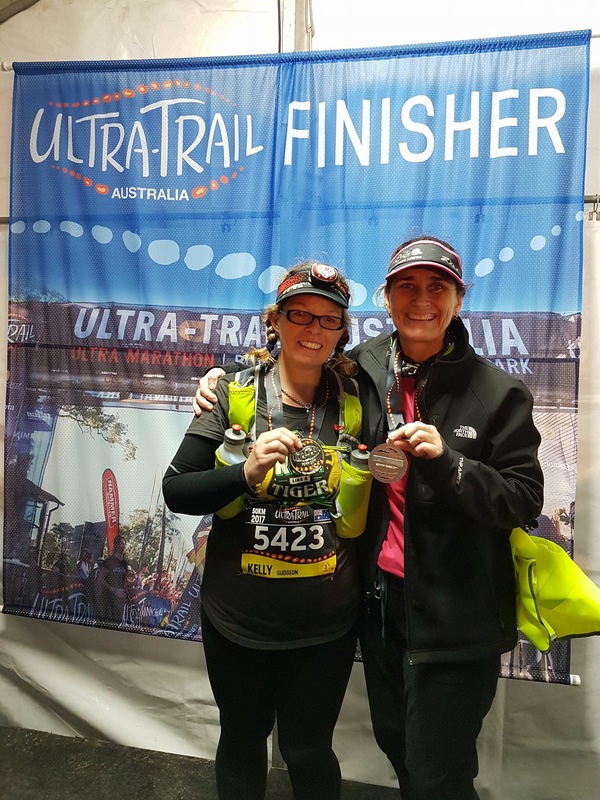 I finished UTA50 and can say I’m an ultra marathoner. I won’t pretend it was pretty or easy. In fact in was brutal. The relentless rain in the lead up at least cleared up for the start, which was delayed for 2 hours. And resulted in a complete course change. The 50km was now to be the first half of the 100km. And most reports are in many ways it was a tougher course. It was very muddy and slippery and the hardest thing I have ever done. I lost my team for most of the race, catching them here and there but really had to deal a lot with my own mental demons on the day. I almost gave up before we’d even reached the first checkpoint because almost immediately we were faced with a ferocious lot of stairs. Feeling like I was going to pass out and this fatigued so soon, I doubted I could do it. But I took a gel. Got my head together and pressed on. 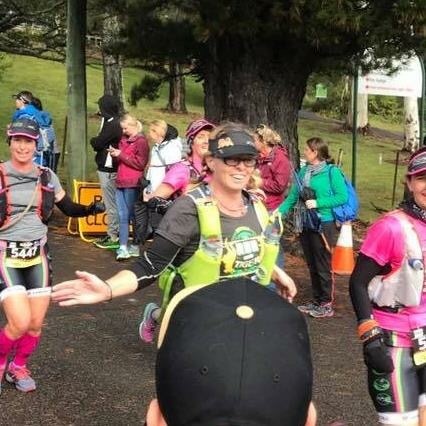 I found Jo and the girls just out of the first checkpoint where Sandy had had a stack. She was a bit beaten up but is tough as nails and pushed on. After here we eventually made our way to Tarros Ladder where we had to wait for more than an hour! The ladder wasn’t nearly as scary as what I thought though. I lost everyone agin not long after here until the next checkpoint and played catch up for much of the race with them. I was doing ok , just going at my own pace until checkpoint 3 when I started to again doubt myself. This was around the 37km mark and when I spotted Jo and the team I burst into tears. It was starting to get dark now so with very special, highly fashionable high vis vests and head torches we set out again. I lost everyone pretty quickly and while I got up the massive hill at about 43km, when we got to the 1000 stairs l started to really struggle mentally. I doubted my bodies ability, my feet to keep going and my brain to talk me through. Thank you to all the people on the track that helped get me up the stairs, and the girl I stayed with for a bit while you puked and I blubbered. Thank you. Also thanks to the 2 volunteers at the top of the stairs who basically caught me and walked up the next hill with me talking me through it. You guys were amazing. Although when you excitedly told me only 4km left, if I had the strength, I may have thumped you. 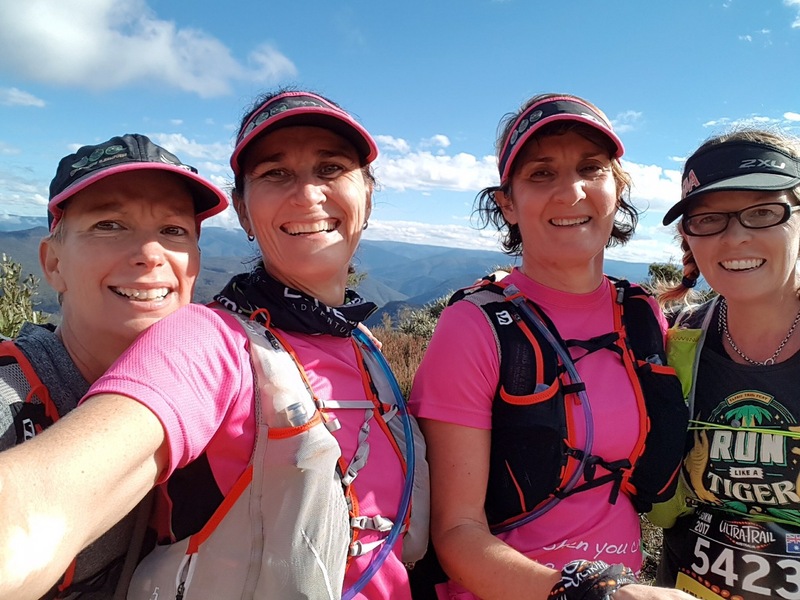 But I got through the streets and the little muddy bush tracks, stacking it in the mud and landing in a prickly bush and to the finish line. I have no idea what my time was but it would have been around 11 hours. I cared about what my time might be before the race but now I’m just thankful I finished, because I almost pulled out a couple of times. So ultra marathon is a tick. Don’t need to do that again! Thanks to Jo and all the team for your support. And to Sel. You are one of my biggest supporters always. Bubbed, is this the new way for mums?